There are books that speak to us plainly, telling their story simply. And then there are books that speak to us in layers of dialog, history, and imagery --Dreamers of the Day is a layer cake. While working my way through Agnes Shanklin's narration I found myself looking up historical facts, for more. And was often moved to share passages aloud with The Sisters, who were equally entertained by this scene where Agnes' former life is left behind in a department store and she emerges a new woman: "Piece by piece over the next two hours, a wardrobe was assembled. Like a butterfly in reverse, I drew on one cocoon after another." 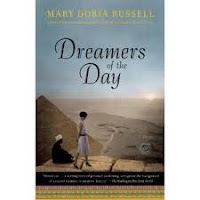 Mary Doria Russell is a gifted writer, capable of entertaining and all the while educating on difficult topics from a very important time in our world's history. When I return my copy of Dreamers of the Day to the library, I will immediately stop by my favorite bookstore and pick up a copy for our shelf, for me, to read again and for The Sisters when they are ready to learn more about their times. Check out Traverse City Reads and join me (The Mom) and The Bean this Wednesday, October 20th when TC Reads present Mary Doria Russell at the Opera House.